"Men wanted for hazardous journey. Low wages, long hours..."
This ad was placed in the early 1900s by explorer Ernest Shackleton as he was looking for men to help him discover the South Pole. The ad drew more than five thousand brave candidates. Are you looking for a safe and stable position today? One that is secure, predictable, and nonthreatening? One where you have a guaranteed salary, a company car, medical benefits, and a three-week vacation? If so, you're probably missing the best opportunities. The great work opportunities today may not look like your dad's dream job. Today, I see fresh college graduates holding out for signing bonuses, guaranteed salaries, benefits, pensions, and stock options before agreeing to work with a company. I see guys who lost a $120,000 job turning down an $80,000 job because it's not what "they're worth" or not a secure position. What is a secure and stable position in today's workplace? General Douglas MacArthur said that security is "one's ability to produce." Knowing what you do well is your only security. It doesn't come from a company, the government, or a union membership. Turn your passion and strengths into your most rewarding work. Here are some challenging inconsistencies we're seeing in those entering the workplace today. There are 75 million people in Generation Y, ages 17 to 32. This is the incoming work force. As I talk to high school and college students, I hear increasing frustration that companies don't value their degrees — those companies only want to know what marketable skills are in place. Thus, a degree in communications may be meaningless. They really don't care about seeing your resume unless the human resource director is supplying her little boy with paper airplanes. Starbucks attracted 7.6 million job applicants over the past 12 months. Procter & Gamble got more than a million applications last year for the 2,000 new positions they had. Google hired 7,000 people in 2011 — after receiving more than 2 million resumes. Many companies don't want your resume. You know what companies do want to see — your online presence. What will someone see if he or she does a Google search for you? If there's nothing there, you are nonexistent in today's workplace. Only 19 percent of hiring managers at small companies say they look at the resumes they receive. What is your online presence? Are you "nonexistent" in today's workplace? Here's another reason corporate America isn't clamoring to give Gen Y workers a "job." Wal-Mart, America's largest employer, is having difficulty finding people to be supervisors. Current employees, many of whom are in this 17 to 32 age group, don't want to be promoted. They don't want a separate office. They don't want to have to discipline their peers. They value freedom and independence more than recognition, titles, and rewards. Sixty-two percent would rather have good friends than a great career. They'd rather have a sense of community and the sense that "we're all in this together" rather than separate themselves in moving up a career ladder. And here's another kicker — 72 percent of college students say they want to be entrepreneurs. They don't want to work for anyone else. Is it any surprise that there are the challenges for that age group in finding great, secure, and profitable jobs? In times of volatility, welcome the possibility of positive new change and challenge. Looking for security may be keeping you from a higher level of success and fulfillment. Be prepared to create your own road. Would You Rather Be Witty or Smart? "Should I do something I love or keep being a responsible provider?" "I'm torn between doing something creative or making money." "I want to be in business but feel called to be in ministry." "I know where my passions and talents are, but I don't know what God wants me to do." "I'd love to be an entrepreneur, but I'm the primary breadwinner for my family." "I'd like to help the less fortunate, but I barely have enough time for my own work." The pattern is that all of these are artificial dichotomies. You don't have to choose one. In each case you can do both. In The 7 Habits of Highly Effective People, Stephen Covey pointed out that most people think in terms of either/or. If you're nice, you probably can't be firm. Or if you're confident, you're not likely to be considerate. Or if I'm buying a car from you, one of us is going to win, and one will lose. So with the false belief that life is a game of choosing, we quickly assume that we can't have two good things at once. What if we started looking only for and solutions? Look at the list above again. Is there any reason you could not do both in any of those situations? Don't deprive yourself of the use of your creativity, the desire to make money, the call to ministry, the need to be responsible, or the call to be an entrepreneur. Do it all. Recently, my wife Joanne wanted to go to the beach, and I felt the need to stay current on my work. So who won? We both won. Why not? We went to Nokomis Beach, Florida, where I worked early each morning while Joanne basked in the sun. We typically had an early lunch, I'd work for another hour, and then we'd hit the shops or be back on the beach for the gorgeous sunsets. And then we'd be at Captain Eddie's or Sharky's for dinner. Look for the and solutions that make your life everything you want it to be. And just for today you can have both pie and ice cream. Then live your life à la Mode. Live your calling AND earn the income you want. Is This Really Hard Work? Don't you hear people talking about "working hard" all the time? The comment may come from a highly paid CEO, a wealthy athlete, a guy on a construction crew, or a stay-at-home mom. What gives us the feeling of working too hard? Recently on a Saturday morning I grabbed a wheelbarrow, a shovel, and a rake and headed for the back section of a nature trail through the woods on our property. The temperature was officially at 99 degrees, the wood-chip pile I intended to spread was dirty and dry, and the trail wound up and down over rocks. It took me about four hours of grueling, dusty, backbreaking work to complete that section of the path. Then I went in, took a shower, and felt energized and invigorated as I joined Joanne to spend time with some friends at their lake house. Was that hard work? In working with people in career crises for 20 years now, I have observed that the work itself does not define hard. And the amount of pay does not correlate with the feeling of hard work. If the work allows creativity, autonomy, and a connection between effort and reward, then a sense of meaning is clear, and no one is found complaining. Conversely, if there is no creativity, autonomy, or connection between effort and reward, then even the easiest work becomes hard. Don't you hear the woman at the checkout counter, having just interrupted her reading of the latest novel, complain about working so hard? But do you suppose the Beatles complained about playing eight hours a night, seven days a week, for years before we ever heard about them? No, they had the three elements of meaningful work long before they became rich as a result. Work is a prison sentence only if it holds no meaning for you. Or as Confucius said, "Choose a job you love, and you will never have to work a day in your life." Here's the irony about doing something that matters. Our assumption is often that if we do something humanitarian, socially responsible, or godly, we will have to subsist on what my friend and financial radio host Dave Ramsey calls "beans and rice." Guess what? Doing something worthwhile, something that engages your passions and your strongest talents, is likely to release more money than you could possibly eke out doing something you hate. Trust me. It's a whole lot easier to make money doing something you love than trying to be responsible or practical doing something you despise. Doing something you love will cause money to show up in unexpected ways. Just draw from your passion and your wisdom to make it happen. In Dream Job... 48 Days to the Work You Love, renowned vocational coach, author, and radio host Dan Miller gives you a complete step-by-step system for clarifying, finding, securing, and maintaining a work life that gives you everything you've ever wanted: true fulfillment and an income that more than supports whatever lifestyle you want to lead. I want to EARN a six-figure income by FINDING or CREATING the work I love! 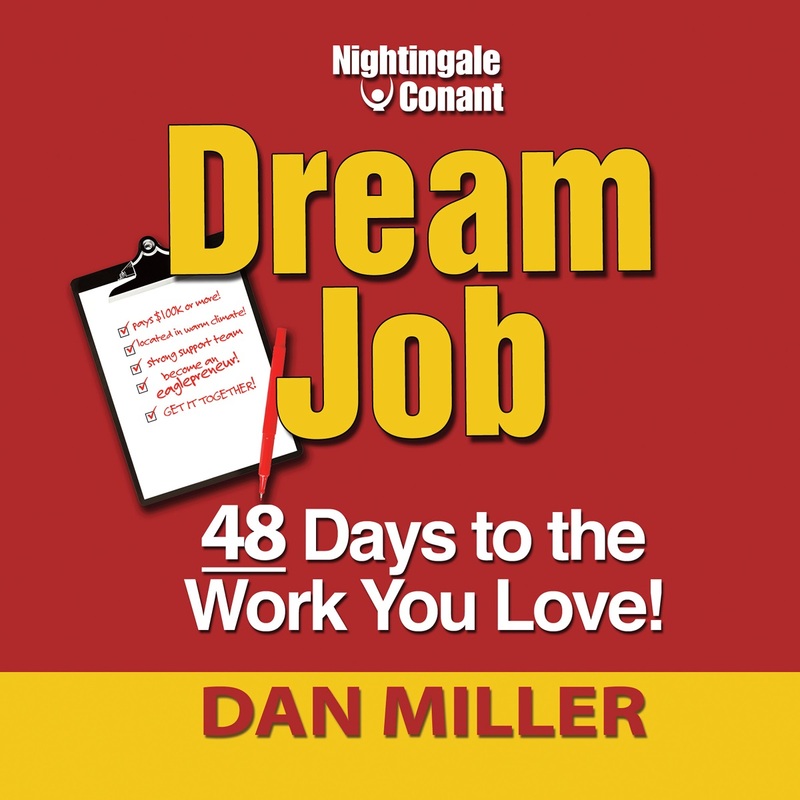 Please send me Dan Miller's bestselling program, Dream Job at the special price below. — I can select one of two ways of ordering.